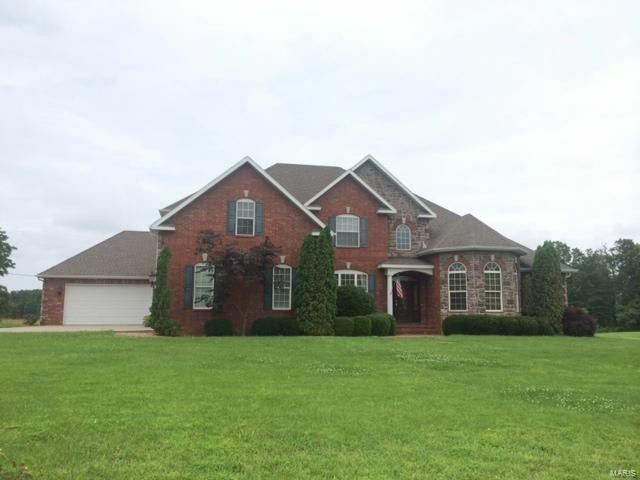 All Brick and Stone Elegant two story home in a wonderful subdivision. 5 bedrooms, 4 baths, 4 car garage. This Beautiful home offers a formal dining room with columned entry, two story entry foyer, vaulted family hearth room with a beautiful stone gas fireplace, breakfast table area. The living area offers vaulted ceilings and the second stone gas fireplace. The gourmet kitchen has a 6 burner Viking gas range with a large island, granite counters, the main level master suite offers a walk in shower and a very large walk in closet and a jetted tub, vaulted ceilings and a beautiful large window. The second level offers a loft area, 3 bedrooms one has a private bath the other two have a jack & Jill style bathroom, great storage area. The rear yard is chain link fenced and there is also a storm shelter. Sunroom, large covered rear porch. The home has a private rear-backyard setting. The main level study can also be used a a bedroom it has a closet & a full bath.